You are here: Home / Money Savin' / BEST DEALS ON... / Farmers Markets vs. 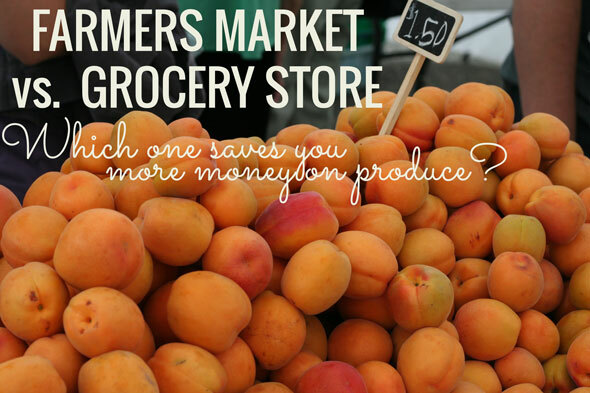 Grocery Store – Where do you save more money? This past Friday, my little guy and I took off to our local farmer’s market. This was our first time going together, and I know he was excited to see all the food plus get to spend some one-on-one time with mom. It was a beautiful day out. The sun was beaming, the sky was gorgeous, the temperature was just right and the entire area smelled like fresh greens and kettle corn. I don’t know, maybe it was the excitement of being able to support local farmers. Maybe it was being in the presence of hippie-looking ladies wearing head scarves and maxi skirts. Maybe it was the free sample of fresh watermelon I tasted when I first arrived or looking at all the beautiful colors of produce. But something in the air was just relaxing, peaceful and happy. Now that I have been growing a small garden myself I can appreciate how much work and knowledge goes into all the gorgeous fresh fruit and vegetables folks there are selling. And it makes me happy knowing that all the food at the market was locally grown, many without pesticides or chemicals. I love the Farmer’s Market, but I have been wondering if the prices are lower or higher than going to the grocery store. Walla Walla Sweet onions (Farmers Market) 2/$1.00 $0.75/lb — Winco $0.78 lb. Organic Apricots (Farmers Market) $1.50 lb — Winco $1.98 lb. Raspberries $3.00/container or $15 for 6 — (Winco) $3.98 12 oz. Raineer Cherries (Farmers Market) $3.00 lb — Winco $4.98 lb. 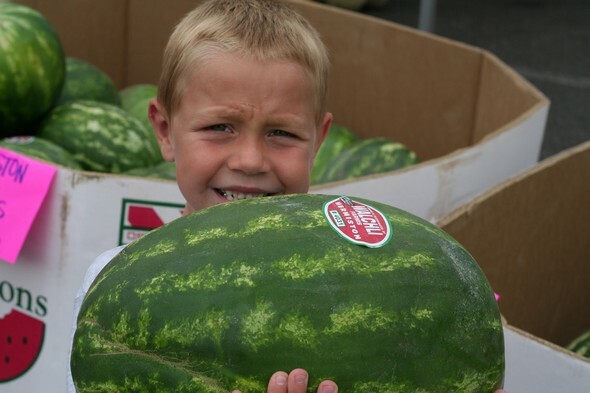 Hermiston Seedless Watermelon $0.49 lb. — (Winco) $0.38 lb. Pesticide free Beefsteak tomatoes $1.99 lb. Which one has better prices? From tallying them all up 16 times on this list Winco beat the Farmers Market price, and 9 times the Farmer’s market beat out the Winco price. So I am going to say that the winner for the majority of lower prices is the Grocery store vs. Farmers Market. I love that the Farmer’s market is fresh, local and mostly organic. Some of the time you don’t know for sure if the items in the farmers market are organic or pesticide free though. I once asked a blueberry seller if their blueberries were organic and they said no. They spray. So that being said, I can’t say for sure all the items are organic or pesticide free. If they were then the farmers market would probably beat out the organic produce prices in grocery stores. The Winco store I went to did not carry many organic items. Which one has better produce? I think I am biased to the feeling I get when I go down to the Farmer’s Market. It’s such a happy peaceful place and I love supporting local growers. However if I took away that feeling, and just looked at the produce I think it can be pretty comparable. 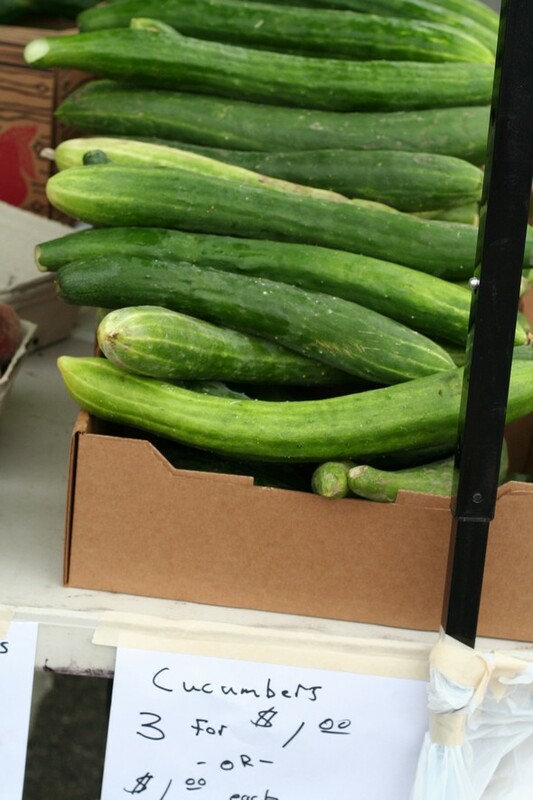 For example, fresh green beans and seedless watermelon were both in season when I went to the farmers market. Both the store and market carried watermelon from Hermiston (which is 30 minutes away from where I am) and the quality was the same. The green beans from both places looked beautiful as well. So I think they are both equally the same when it comes to product. Gosh, that is a tough one. I love Farmer’s Markets. Love love love. But if I was on a tight budget I would stick with the grocery store. Make sure you walk through the whole market and take note of the prices of the items you are looking for before making your purchase. 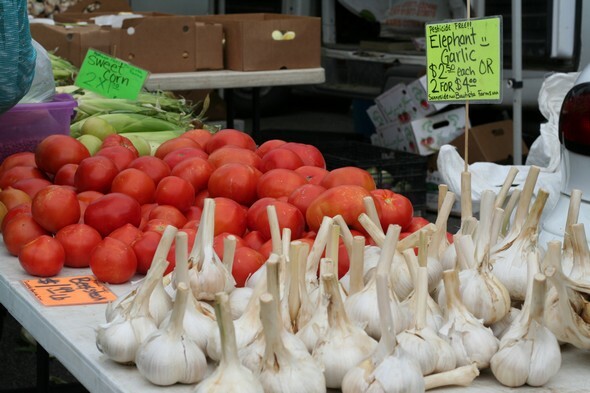 Many sellers offer the same fresh produce and some have different prices. I wanted some fresh green peppers and many had them 2/$1.00 but a couple of vendors had them for 3/$1.00. It pays to look around before you purchase. Make sure you bring cash with you. Not many of them have a swiper for a credit card at their stands. I brought $20 with me and spent about $15. Sometimes farmers will drop their prices right before time to close to ensure they sell everything they brought with them that day. If you wait sometimes you can save up to ½ off what the price was. But this can be risky too, because if they sell out of the item you want, it’s gone. All in all it was a wonderful day for me and my son at the farmer’s market. I can’t wait to go again. If you’re wanting to check out all the fun for yourself, check out LocalHarvest.org to find the nearest farmer’s market or comparable grocery near you. What do you think? 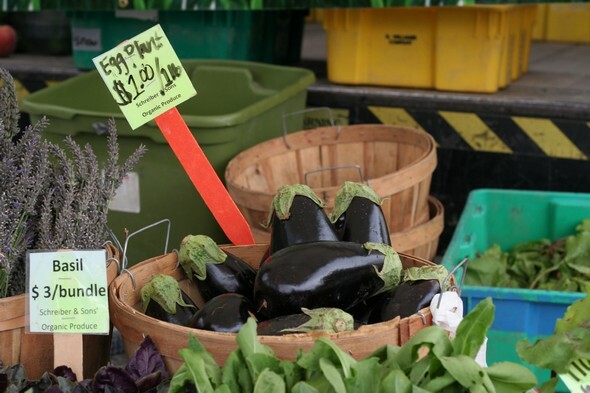 After looking at the prices are you going to stick with grocery store or farmers markets for fresh produce? Hi Karrie, if you’re to ask me, I’d prefer to buy stuff in the local market rather than a grocery store. Why? First, because the foods are fresher. Second, they are cheaper. And lastly, we are helping our local farmers in earning the profits of their labor! Thanks and more power! Our farmers market at Clark Park, Tempe, AZ, is way cheaper than our local Safeway. It is really small though and only has about 20-25 vendors. Carrots are 25c each. Thank you for this useful post, it was indeed interesting! As a student and for my study, I need to find the prices of fresh fruits and vegetables on farm vs retail vs industry but I have difficulties to find good comparisons except for USDA website. Does anybody knows a good sources I can check? As a grower that sells at the farmers markets this post was honestly upsetting to me. I think people need to take much more into consideration than comparing our prices to the chain grocery stores because honestly, there is no comparison. If you want cheap, mediocre food, by all means, compare away and purchase from the grocery store where most of the produce is shipped in from (often) other countries. Even the “organic” produce is sprayed with approved chemicals, mass productions often under pay their labor workers, force small farms out of business, and do more harm than good for the environment. Tomatoes, strawberries, and multiple other things are first sprayed with preservatives and then sprayed with more chemicals or gasses to ripen during shipping. Countless pounds are then tossed out. Our family is on a strict budget but it’s all about priority, we’d rather support our small, local, family run farms and pay them top notch for the wonderful things they provide. If we can’t afford meat for every meal because it’s not “cheap” enough, guess what? We don’t eat meat. I often work in the garden and wonder… If the people who talked about price per lb for the delicious heirloom tomatoes I grow came and worked by my side for a few days, would they have a different view? Maybe they’d suggest I charge more? Support your local farms, pay them well, and please don’t compare our prices to the grocery store… It’s more than numbers on paper to us, it’s our livelihood and we work hard to provide you with good, nutritious, well cared for, and happy food. Interesting comparison. I find that the things I’ve gotten at farmer’s markets have been generally much better quality than the grocery stores. Grapes from the grocery taste like wood, tomatoes taste like watery gourd-wood. Inedible and tasteless cantaloupe. I mean not all their produce is terrible at my local grocery stores, but the stuff that needs to be picked really green because it ripens fast and needs to go through the distribution chain and sit in a store for a week or something before they sell it is often really, really sad and flavorless. Here in California the prices are often very similar (depending on the market), but the quality isn’t always similar at all. I also find that I will find many varieties of things or even different fruits & vegetables that I’ve never, ever seen most grocery stores carry. It also really depends on the market. We have a big one that has good prices and it’s one of the oldest in California, but it’s a little out of the way. Meanwhile some of the smaller, more central ones in posh parts of town really have much worse prices and no better produce. I encourage people to shop Farmer’s Market! I am not familiar with Winco, but Farmers’ Markets help support the local economy on so many levels (local business, local families and nutrient dense foods). Some markets try to help people that are on SNAP or WIC with a ‘matching funds’ program. Ask about an Access to Healthy Foods program to find out if you are eligible! This topic gets complicated very easily as there are many parts of the equation. I totally understand and have the budget issues, but I have found taking only a certain amount of cash helps me keep my budget and often times I am stunned with the amount of produce I come home with. I like the idea of going and buying what is fresh and in season–I like getting to know where everything is coming from– and I like feeling like I am doing something helpful for our farmers. That’s just my “two unsolicited cents” on the topic. I will say that we have a Super King near by and I shop there as well. They post just about everything (produce,fruit & fish and meat) with a label that shows where it came from. I like and respect them for that. I know other grocery stores are doing that as well, but it stands out at Super King. I just came across your blog this morning, via Pinterest and looking for camping secrets– and now? 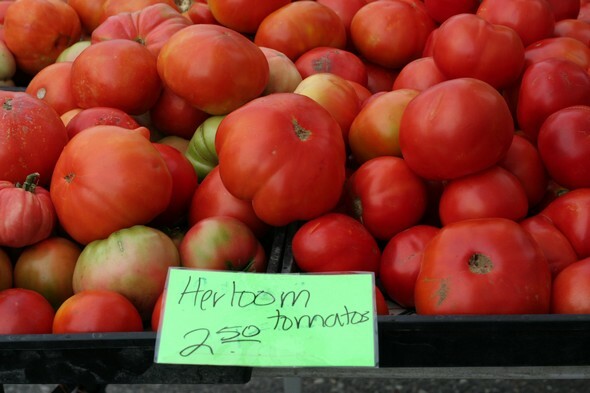 I’m a subscriber…..
A great way tog et good deals at markets and produce stands is to make offers for bulk purchases. Ask to buy what’s left–making a reasonable offer seems to benefit all because they’re guaranteed the sale (no fun to throw away something you could have sold) and you get plenty for processing (jams, canning, etc). I like this for things that store well (onions and garlic), and things that are fun and easy to do (pickles top my list). Thanks for the post. What a lot of work to compare all the prices. As a farmers’ market manager, people ask me all the time how our prices compare to the grocery store. This makes me want to do a side by side comparison some time next year. I think one of the biggest obstacles for our customers is getting used to seasonal availability. We had people looking for peppers in the spring and rhubarb in mid summer. Grocery stores just have stuff all the time, without even a huge price change. I still choose the farmers’ market when I can, but maybe I am biased. 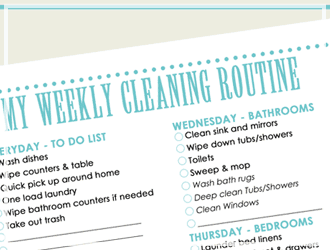 I found your blog today and I love it! I live in NWA and don’t have Winco and actually never heard of it. I live in town of Walmart and there is literally a wally world on every corner. I hate walmart! It is the cheapest in town which puts us in a pickle sometimes. We try not to patron walmart if we can help it. We have harps and typically spend our money there! 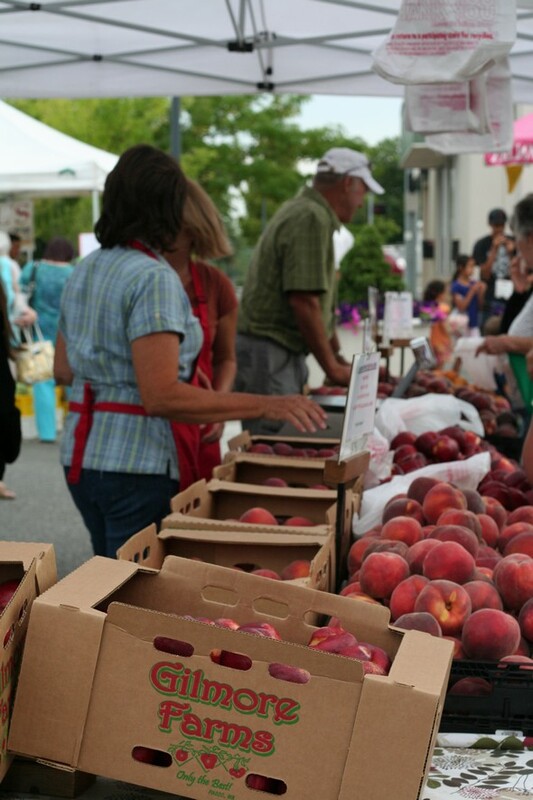 Although we are home to some of the best farmers markets! Because there are a lot of people that eat and grow organic foods, we can find a lot of great food at the farmers markets! This is where I have to buy my grass fed meat and am able to place orders with them year round through the online farmers market here! I have to pay more but with my dietary restrictions…it’s definitely the way to go for our family! Being a Long Islander who is now in NC I can say the produce prices in supermarkets aren’t that great & the quality of the produce is oftentimes even worse. There are so many farm stands down here that I use them as often as I can regardless of price. I have yet to actually go to a farmers’ market though. I do have to get my lettuce & exceptionally expensive asparagus from the grocery stores. Personally, I buy as much as I possibly can from local-grown. Prices may be higher, but if you take into consideration the subsidies that factory farms get (local producers pay more to raise their stuff), and the treatment factory farmed animals suffer, then the cost to the planet of shipping items hundreds or thousands of miles… all that rather changes the equation. Then, if you’re into survival but can’t grow your own, why become dependent on shipped food? If you don’t buy local, and local producers go out of business, what happens when the commercial food chain breaks down? This is a great article, Karrie…but it made me so very homesick!! I’m a US Navy wife, and this is our 3rd Summer living in Japan! 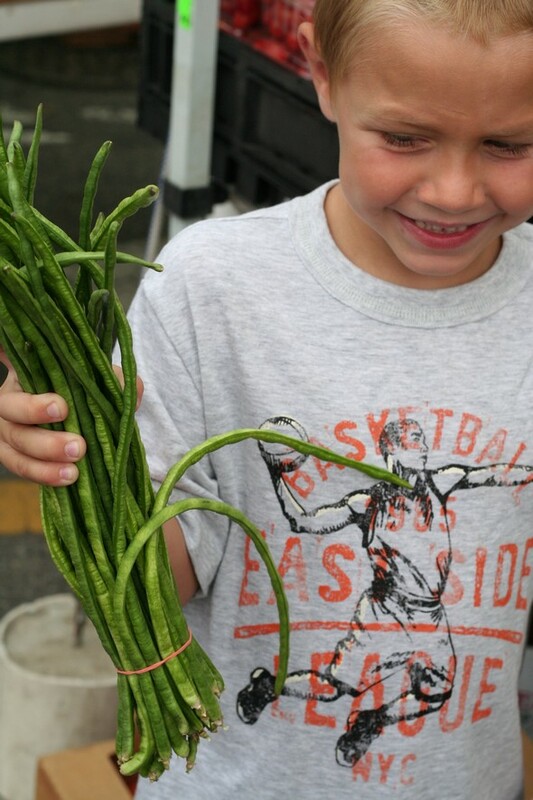 I grew up a country girl, and living on a farm I learned the value of home-grown and the joys of the Farmer’s Market! I love how you did price and quality comparisons in your article! I was taught to do the same thing! Over here, I have had a garden (yes, even on Base Housing! )…it gets strange looks from the neighbors (they have flowers growing in their front yard…I’ve got tomatoes, corn, salad greens, etc.). In my research living here, I have learned that for produce, the Base Grocery (Commissary) is NOT the place to go! The prices are high and very few items are fresh. It all has to be shipped from the states & go through Japanese Customs before they get to the store, so both cost and quality reflects this process. Here in Japan, there aren’t many “formal” Farmer’s Markets, per se, but they have small (sometimes large) street markets with everything that a neighborhood needs…including produce! These markets are great places to get anything fresh…fish, meat and produce…because all these items are brought in daily, fresh from the boat, butcher and farm!! The prices are lower than the base store and you can’t beat the prices!! So please pass along to your readers who are Military living overseas my advice to get off base and compare what the local community does for fresh produce (Farmer’s Markets or street markets, or something else). It’s always a great adventure and guaranteed get you closer to fresh tasties & help you learn how another culture does it! this was a great article to read, unfortunately where I live (near philly) our farmers market prices are usually half of the grocery store AND the past few months I have been finding more and more mold on produce while its on the shelf EWWW. I love the taste and price of local and it feels good knowing it hasn’t been sitting on a shelf for however long. Agree with Christy — Winco produce has brought me nothing but disappointment. Haven’t bothered with it in ages. Growers who expect to have to ship their product hundreds or thousands of miles to grocery stores have to focus on the varieties of fruits and veggies that ship the best — ones that resist mold or don’t bruise as easily. 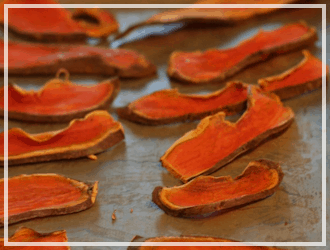 These varieties aren’t necessarily the ones that taste the best! 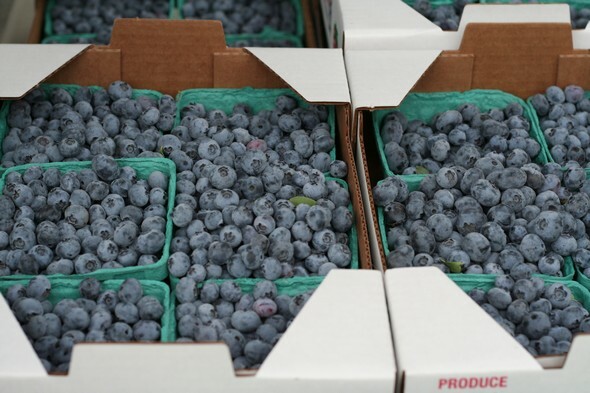 Growers who sell locally don’t have to bother with growing varieties that keep well but taste like cardboard — they can focus on what tastes the best fresh and what their local customers like. If you’re interested in any kind of preserving, you can get a lot more useful information from the local growers at the farmers’ markets than from most grocery stores. No clerk at Winco is going to know whether their peaches are freestone or cling — and if you’re making jam or baby food, this is vital information! So yes, while grocery story produce is often cheaper than what you find at farmers’ markets, this is one of those cases where you may get what you pay for. The one local exception for grocery store produce is Yoke’s. Their Fresh Friday deals can be pretty spectacular, are often local, and I found their produce associates to be more knowledgeable and helpful than most. We moved back to Western OR a few years ago, and man alive, do I miss my local Yoke’s. Haha…Sorry, Karrie, didn’t mean to give you another assignment! 🙂 But seriously, thanks so much for all the price sleuthing and everything else you do. It’s been SO helpful over the years! I have made similar observations about pricing but I think to get a fair price comparison, you should have gone somewhere with similar quality produce. Winco’s produce so typically below par and the farmer’s market finds are such good quality that I think the price is worth it. I seldom buy produce at Winco and when I do, it doesn’t last very long before going bad so that is another factor in price. So, I personally prefer the Farmer’s Market. Thanks for all the time you spend finding this info for us!! I agree that for Winco produce just isn’t the same as farmer’s market produce. Where I live, Winco’s produce is very good quality! I never have issues with it! I’ve seen this quality issue very clearly in the shopping choices I have in Worcester MA. I frequent a farm stand (year round), a couple of regional supermarkets, and a discount supermarket all in my shopping radius. Recent comparison: the discount market had Romaine lettuce at 99c a head but it was quite small and past freshness, so whatever vitamin value it had was probably gone. The regional supermarkets have consistently good produce but they kind or rate a ‘b’ most of the time at $1.99. The farmers market has romaine at $1.99 but it’s often far better than the supermarkets. So if I were strapped for cash and couldn’t do the farm stand, I wouldn’t go to the discount store… I’d just make sure my husband and I took our multivitamins. Plus, I have been shopping at this farm stand for years and am acknowledged by the kids who work there. You’re right the farmer’s market is a wonderful event, but the grocery store is more budget friendly. But I consider my visits to the farmer’s market more entertainment than part of my grocery shopping, so the extra cost is worth the occasional shopping spree. I so agree, I love the feeling and entertainment of the farmers market. I enjoyed reading this post as I am in the process of establishing a business as a market gardener in south Texas. One thing I would like to bring up for anyone who may come across this conversation is the global impact involved in grocery chain produce. The majority of produce you purchase at a chain store was produced and harvested using slave labor. Another factor to consider before you fall for cheap prices. markets here in Florida just bring it in from commercial produce warehouse. But we are luck to have people growing right at thee homes and selling to the public that don’t use sprays etc pesticides. Prices might be lower on some and higher on others but we know where it came from and that make me feel better, even pick it ourself.